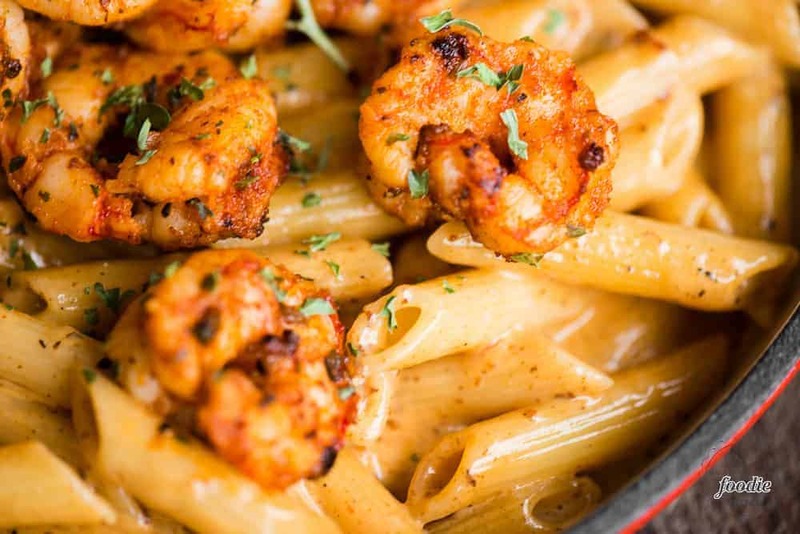 Cajun Shrimp Pasta with a spicy and rich cream sauce. This is a quick and easy dinner recipe with just the right amount of kick! Tender whole shrimp smothered in a quick and easy spicy cream sauce with just the right amount of perfectly cooked pasta. YUM! 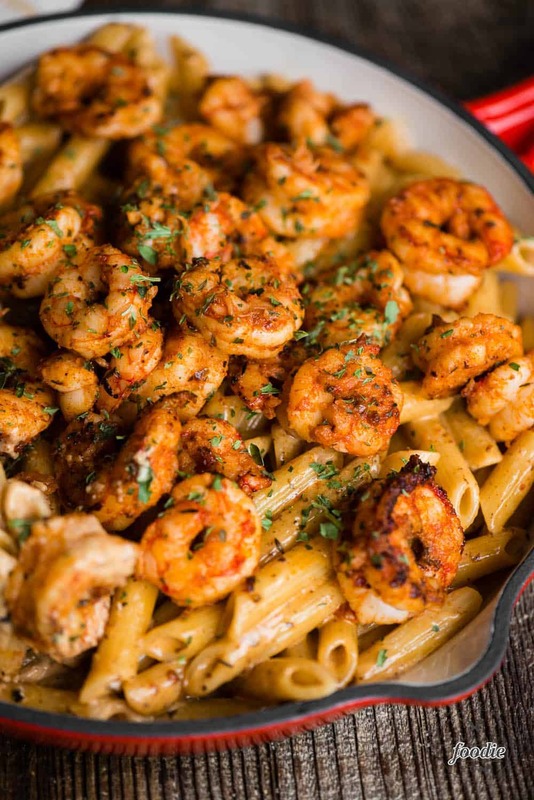 This Cajun Shrimp Pasta dinner recipe has everything you could possibly want. Tender and succulent shrimp is coated in the cajun seasoning which adds just the right amount of flavor. The cream sauce only takes a few minutes to come together and the pasta soaks up all the flavor. There are two things I can always make for dinner that will have my family drooling: shrimp and pasta. On the nights when I go that extra mile and actually make homemade pasta, we all eat way too much because nothing quite beats the taste of fresh pasta. But, most nights call for a quick and easy dinner, so dried pasta from the store is in order. I wasn’t sure if my kids would like the cajun seasoning, and although it was more spicy than the foods they typically eat, they simply couldn’t resist the fact that I made sauteed shrimp with pasta in a cream sauce. It’s basically their love language. The apples don’t fall far from the tree! This really is a quick and easy dinner recipe perfect for a busy weeknight. Since there is little measuring and no chopping, the entire recipe can pretty much be cooked in the amount of time it takes to cook the pasta. That means that in 10-15 mintues, you can have a complete dinner. This recipe starts by boiling the pasta in salted water. It’s important to use a full tablespoon of salt in your pasta water because the salt will flavor the pasta. Before you drain the pasta, be sure to reserve some of the pasta water to thin out the sauce later, if needed. While the pasta is cooking, saute the shrimp. They will cook quickly over relatively high heat. You’ll remove the shrimp from the pan and set them aside and then use that same pan to make the sauce. The cajun cream sauce is simply a mixture of heavy cream that you bring to a boil and parmesan cheese that melts in creamy smooth. There’s enough cajun seasoning ont he shrimp and in the pan to give the sauce plenty of flavor. The sauce thickens within minutes and then you simply toss everything together to serve. Since this recipe is rich and heavy, this pasta dish is wonderful with vegetables of some kind. Either a healthy green salad or a side of steamed broccoli or spinach goes great with this dinner. The Cajun Shrimp Pasta has so much flavor the the vegetable side dish you choose should be simple and light to help balance everything out. I always opt for wild caught shrimp over farmed shrimp. I find that there is a huge difference in taste and texture and it’s worth it to eat wild caught. Also, with shrimp, I most often recommend bigger is better. I’m not a fan of those teeny tiny bay shrimp. I prefer my shrimp be at least two bites worth. Rather than buying fresh shrimp, I often buy frozen shrimp by the pound so that I always have some at the ready in the freezer! 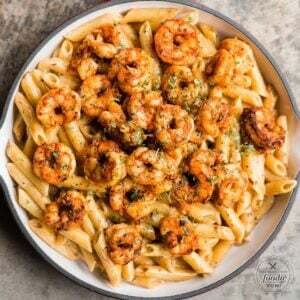 Cajun Shrimp Pasta with a spicy and rich cream sauce is a quick and easy dinner recipe with just the right amount of kick! Add salt to pot of water and bring to a boil. Cook pasta to al dente doneness. Before draining, scoop out at least 1/2 cup of the cooking water. Drain pasta and set aside. While the pasta is cooking, cook the shrimp and sauce. Combine shrimp with cajun seasoning and olive oil in bowl. Toss to combine. Heat large skillet over medium high heat. Add butter and melt. Add shrimp in a single layer and cook until golden brown on each side, turning only once. You may have to cook shrimp in two batches to allow enough room. Once done cooking, transfer cooked shrimp to a clean plate and reduce heat to medium low. Add heavy cream to pan and scrape bottoms to release any food that is stuck to the bottom. 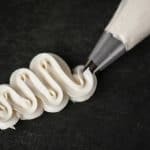 Allow cream to bubble. Reduce heat to low and stir in parmesan cheese to melt. Add cooked pasta and shrimp and stir to coat. If sauce needs to be thinned, add pasta water, one tablespoon at a time, until desired consistency is achieved. 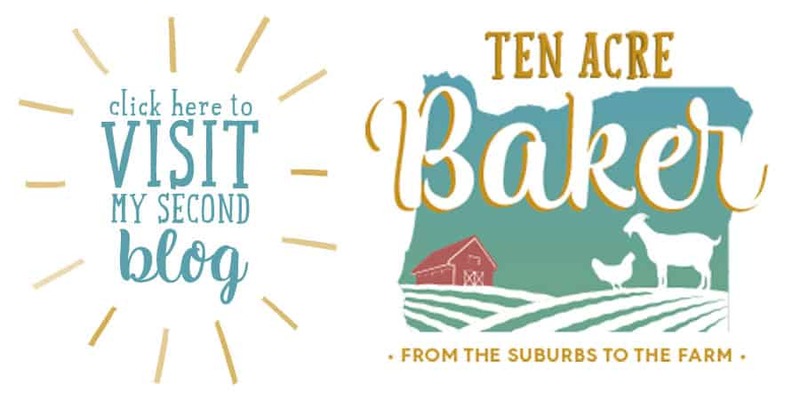 This post was originally created for Centsless Meals where I was a contributor and has been updated with more fun facts and tidbits for your reading pleasure. Why are you sorry? 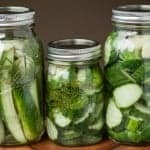 A few simple modifications and dieters can have it too! Zoodles, fat free half and half,… I can make this work on Weight Watchers! You’re the best, Debi! Yes – so many modifications you guys can make to adapt the recipe to any dietary needs. Plus – shrimp is a great source of protein! Hi Larry, There should be a “pin it” option over the photos. Is it not showing for you? Does it matter if the shrimp is already cooked prior or is it better to buy it raw? Nope. You would just want to heat it through and not overly cook it. That’s all! Otherwise it’ll work great. I might have missed it but what do you do with the 1/2 cup of water you took out of the pasta water? Thank you! Hi Shari, I just updated the recipe to include this: If sauce needs to be thinned, add pasta water, one tablespoon at a time, until desired consistency is achieved. Sorry I left that part out! This pasta was so good. We love Cajun anything and this really hit the spot. Shrimp dinners are my weakness!! I love how much flavor this one packs!! Thanks!! I wish I could eat this 7 days a week! Beyond delicious. My husband is a HUGE shrimp lover and these look so amazing! Can’t wait to make these for him for dinner! 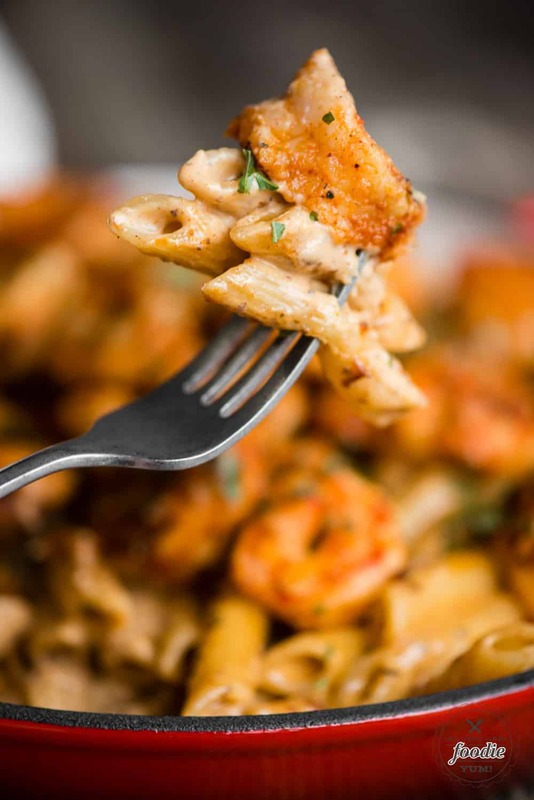 We love this shrimp pasta….so good!!! We have it at least a couple times a month! 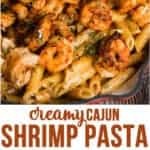 What are the ingredients that you have used like he type of Cajun season and pasta sauce ? 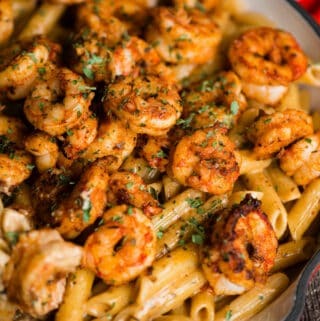 I used these two recipes when making my Cajun shrimp pasta: https://selfproclaimedfoodie.com/homemade-cajun-seasoning-mix/ and https://selfproclaimedfoodie.com/alfredo-sauce/. Everything should be in the cajun shrimp pasta recipe itself though. Hi Bri, This recipe makes about 6 servings. Looked for q quick and easy dish to make. I am so glad I came across this recipe.. Delish! 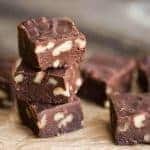 Would substituting whole milk for heavy cream still work? Hi Beth, It would probably work but the heavy cream makes for a much creamier, decadent sauce. 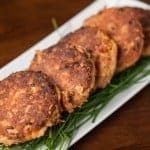 Can chicken be used instead of shrimp in this recipe? How is this when served cold? Anyone try it? Delicious. I used “Slap Ya Mama” Cajun seasoning. The only substitute I made was for Coconut Cream instead of heavy cream.